Photosynthetic water oxidation is catalyzed by the oxygen-evolving complex (OEC) in photosystem II (PSII). This process is energetically driven by light-induced charge separation in the reaction center of PSII, which leads to a stepwise accumulation of oxidizing equivalents in the OEC (Si states, i = 0–4) resulting in O2 evolution after each fourth flash, and to the reduction of plastoquinone to plastoquinol on the acceptor side of PSII. However, the Si-state advancement is not perfect, which according to the Kok model is described by miss-hits (misses). These may be caused by redox equilibria or kinetic limitations on the donor (OEC) or the acceptor side. In this study, we investigate the effects of individual S state transitions and of the quinone acceptor side on the miss parameter by analyzing the flash-induced oxygen evolution patterns and the S2, S3 and S0 state lifetimes in thylakoid samples of the extremophilic red alga Cyanidioschyzon merolae. The data are analyzed employing a global fit analysis and the results are compared to the data obtained previously for spinach thylakoids. These two organisms were selected, because the redox potential of QA/QA− in PSII is significantly less negative in C. merolae (Em = − 104 mV) than in spinach (Em = − 163 mV). This significant difference in redox potential was expected to allow the disentanglement of acceptor and donor side effects on the miss parameter. Our data indicate that, at slightly acidic and neutral pH values, the Em of QA−/QA plays only a minor role for the miss parameter. By contrast, the increased energy gap for the backward electron transfer from QA− to Pheo slows down the charge recombination reaction with the S3 and S2 states considerably. In addition, our data support the concept that the S2 → S3 transition is the least efficient step during the oxidation of water to molecular oxygen in the Kok cycle of PSII. 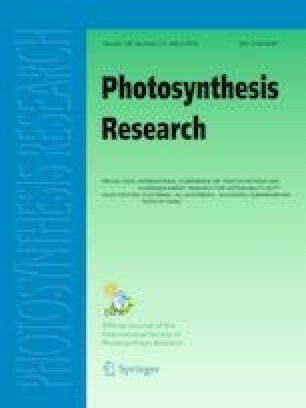 This paper is dedicated to Govindjee who was honored, along with Bill Cramer and A.S. Rahavensdra, at the 8th International Conference on Photosynthesis and Hydrogen Energy Research for Sustainability, held in Hyderabad, in November, 2017. Cyanobacteria, algae, and higher plants capture sunlight to store its energy in the chemical bonds of carbohydrates, proteins, and lipids. The electrons and protons used for atmospheric CO2 fixation are extracted from water. The electrons are then energized to the reduction potential required for CO2 reduction in two light-driven charge separation reactions performed in the reaction centers of photosystems II (PSII) and photosystem I (PSI), and stabilized by multiple electron transfer events to allow the slow chemistry of water oxidation and CO2 fixation to occur. The side product of solar-driven water oxidation is molecular oxygen, which sustains all aerobic life on Earth (Govindjee et al. 2005; Renger 2008; Barber 2009; Shevela et al. 2012; Blankenship 2014; Cardona et al. 2015). The reaction sequence in the PSII complex, which catalyzes water oxidation to dioxygen, can be divided into three main events that occur at different time scales. Photon capture in the light-harvesting antenna of PSII and excitation energy transfer to the reaction center lead to the formation of the excited state of the primary donor, P680*, which is a chlorophyll (Chl) dimer. P680* transfers its excited electron within picoseconds to the primary acceptor pheophytin, Pheo (Fig. 1a) (Mamedov et al. 2015; Mirkovic et al. 2017; Romero et al. 2017). The subsequent electron transfer steps, which increase the spatial separation and decrease the potential difference between the photo-generated charge pair, minimize the chance for charge recombination reactions. These processes occur over a wide time span (10 ns–100 µs) and include on the acceptor side electron transfer from Pheo•− to the firmly bound plastoquinone QA, and further to the second, exchangeable plastoquinone, QB. On the donor side, P680•+ is reduced by tyrosine Z, YZ (D1-Tyr161), which in turn oxidizes the oxygen-evolving complex (OEC) of PSII. Repetition of these steps allows for multi-electron and multi-proton chemistry to occur at the 100 µs–1 ms time scales. These reactions form plastohydroquinone on the acceptor side and molecular oxygen in the OEC on the donor side of PSII (Renger and Renger 2008; Blankenship 2014). At the heart of the OEC is the Mn4CaO5 cluster (Fig. 1b, center). This inorganic core unfolds its full catalytic potential within the special protein and water environment of its binding pocket. The structure of this complex catalytic site has been revealed by years of research employing EPR, EXAFS, and X-ray crystallography measurements, as well as theoretical calculations for recent contributions (e.g., Messinger et al. 1997; Peloquin et al. 2000; Zouni et al. 2001; Cinco et al. 2002; Robblee et al. 2002; Ferreira et al. 2004; Yano et al. 2006; Kulik et al. 2007; Dau and Haumann 2008; Siegbahn 2009; Umena et al. 2011; Glöckner et al. 2013; Shoji et al. 2013; Cox et al. 2014; Yano and Yachandra 2014; Krewald et al. 2015; Suga et al. 2015; Young et al. 2016). This pocket positions a network of hydrogen-bonded water molecules around the inorganic unit (Umena et al. 2011), thereby orchestrating the proton-coupled electron transfer events required for the accumulation of four oxidizing equivalents and the subsequent water oxidation chemistry (Lavergne and Junge 1993; Rappaport and Lavergne 1997; Dau and Haumann 2008; Service et al. 2010; Rappaport et al. 2011; Nakamura et al. 2016; Nilsson et al. 2016). On the basis of the period four oscillation during flash-induced oxygen evolution, first measured by Joliot et al. (1969), and additional experiments, five oxidation states of the OEC were identified and named by Kok and coworkers as the S0, S1, S2, S3, and S4 states (Fig. 1b) (Kok et al. 1970; Joliot and Kok 1975). For different, earlier proposals, see Joliot et al. (1969) and Mar and Govindjee (1972). Proton release occurs on all transitions, except the S1→S2 transition (Rappaport and Lavergne 1991; Schlodder and Witt 1999). This is important, to allow YZ•, which has a near constant oxidation potential throughout the reaction cycle, to stepwise oxidize the Mn4CaO5 cluster. Thus, in the positively charged S2+ state, initially a proton needs to be released to allow oxidation of the neutral S2n state to the S3+ state (Rappaport and Lavergne 1991; Klauss et al. 2012). This step is also likely coupled with the binding of one water molecule to the Mn4CaO5 cluster (Haumann et al. 2005; Suzuki et al. 2008; Siegbahn 2009; Suga et al. 2015, 2017; Capone et al. 2016; Retegan et al. 2016; Ugur et al. 2016; Kim and Debus 2017). Similarly, S3n state needs to be formed by a proton release from S3+ before the OEC can be further oxidized and in turn form O2 from the two substrate ‘water’ molecules (Rappaport et al. 1994; Rappaport and Lavergne 2001; Dau and Haumann 2007; Klauss et al. 2015). The most stable oxidation state of the OEC is the S1 state, in which the four Mn ions have the oxidation states III, IV, IV, III; in the order of numbering in Fig. 1b (Krewald et al. 2015). The S2 (III, IV, IV, IV) and S3 (IV, IV, IV, IV) states decay to the S1 state within seconds to minutes via reduction by the reduced form of tyrosine YDRED (D2-Tyr160) or recombination with QB− (Diner 1977; Rutherford et al. 1982; Robinson and Crofts 1983; Rutherford and Inoue 1984; Vermaas et al. 1984, 1988; Nugent et al. 1987). In addition, a very slow decay was reported, but the electron donor for this phase was not yet identified (Styring and Rutherford 1988). By contrast, the S0 state is slowly oxidized to the S1 state by the long-lived YDOX radical, but is stable if YD is reduced (Styring and Rutherford 1987; Vass and Styring 1991; Messinger and Renger 1993). The highly reactive S4 state oxidizes two water molecules into molecular oxygen. Through this process, four electrons are injected into the OEC, effectively resetting the system for the next cycle into the S0 state (III, IV, III, III). The damping of the period four oscillation in flash-induced oxygen evolution shows that the Si state transitions do not occur with 100% efficiency. This inefficiency is described in the Kok model mostly by the miss parameter, which gives the average probability that an Si state does not advance, upon saturating flash illumination, into the next higher Si+1 state (Forbush et al. 1971; Delrieu 1974; Messinger and Renger 2008). Typical values for the Si-state-independent miss parameter range between 10 and 15% (Messinger and Renger 1994; Isgandarova et al. 2003). Depending on the width of the exciting flash, typically also 0–5% of double advancements (Si to Si+2 transitions) contribute to the S state mixing with increasing flash number. Under saturating illumination, the miss parameter has been proposed to be governed by either the redox equilibria between the redox cofactors at the donor or acceptor sides, or by kinetic limitations (Renger and Hanssum 1988; Meunier and Popovic 1990; Shinkarev and Wraight 1993; Christen et al. 1999; de Wijn and van Gorkom 2002; Han et al. 2012). To minimize the possibility of kinetic limitations, we employed in this study a flash frequency of 2 Hz. In addition, we explicitly account for back reactions of the S states by our global fit analysis (Vass et al. 1990; Isgandarova et al. 2003; Pham and Messinger 2016). Thus, the efficiency of the Si state turnovers is expected to be governed by redox equilibria between all the electron transfer cofactors of PSII. These equilibria prevent, in a random fashion, a certain percentage of centers (miss parameter α) from advancing to the next higher oxidation state Si (i = 0, 1, 2, 3, 4) by preventing a stable charge separation. In this regard, especially the presence of QA−, Pheo−, P680+, and/or YZ• at the time of flash excitation is of note, which may vary with a period two on the acceptor side and a period four on the donor side (Naber et al. 1993; Shinkarev and Wraight 1993). In addition, inefficiencies of the Si state transitions caused by deprotonation events (Forbush et al. 1971) or structural equilibria, as that in the S2 state between the EPR multiline and the g = 4.1 state (Retegan et al. 2016), may lead to a Si state dependence of the miss parameter. Recent work by several groups provided experimental support for the Si state dependence of the miss parameter. While fluorescence experiments by de Wijn and van Gorkom (2002) and FTIR experiments by Takumi Noguchi’s group (Suzuki et al. 2012) suggest that the miss parameters αi increase from α0 to α3, Stenbjörn Styring and coworkers concluded on the basis of EPR experiments that the highest miss factor is associated with the S2→S3 transition (Han et al. 2012). We have recently developed a new kinetic Kok model that allows fitting a regular 2 Hz flash-induced oxygen evolution pattern (FIOP) simultaneously with 44 FIOPs obtained during the S2-, S3-, and S0-state lifetime measurements (Isgandarova et al. 2003; Pham and Messinger 2016). This global analysis, which works akin to decay-associated spectral analysis, indicated that the majority of misses occurs in spinach thylakoids at neutral pH in either the S2→S3 or the S3→S0 transition. In addition to misses, a small percentage of double hits (β; Si→Si+2) is observed if light pulses of µs duration are employed. The extremophilic red alga Cyanidioschyzon merolae grows in hot springs at a very low pH (0.2–4.0) and moderately high temperatures (40–56 °C) (Ciniglia et al. 2004; Ferris et al. 2005). The intracellular pH of C. merolae is tightly controlled metabolically and maintained in the pH range of 6.3–7.1 over the extracellular pH range of 1.5–7.5 (Zenvirth et al. 1985; Enami et al. 2010). The photosynthetic apparatus of this alga is an evolutionary intermediate of cyanobacteria and higher eukaryotic phototrophs, containing combined prokaryotic and eukaryotic structural and functional features. Both PSII and PSI complexes from this acido-thermophilic alga are characterized by unprecedented robustness across a wide range of external conditions and recently molecular mechanisms underlying such resilience to adverse conditions have been revealed including reaction center-based non-photochemical quenching in PSII, accumulation of photoprotective carotenoid zeaxanthin (in PSII and PSI), and remodeling of the external light-harvesting antenna in PSI (Krupnik et al. 2013; Haniewicz et al. 2018). The PSII complex in C. merolae is reminiscent of its counterpart in cyanobacteria, but the OEC is protected by the additional fourth extrinsic subunit PsbQʹ, over and above the three proteins present in cyanobacteria, PsbV, PsbU, and PsbO (Ohta et al. 2003). The PsbQʹ subunit has been localized by electron microscopy coupled to single particle analysis (Krupnik et al. 2013) as well as recently by X-ray crystallography (Ago et al. 2016) on the lumenal side of PSII in the vicinity of the CP43 and PsbV proteins, close to the membrane plane. The function of PsbQʹ has been recently elucidated by reconstitution of this protein with the cyanobacterial PSII followed by measurement of the QA redox potential in thus modified complex. In these experiments, the redox potential of QA was shown to be positively shifted when PsbQ′ was attached to the PSII complex, likely resulting in a decrease in the amount of destructive triplet Chl species (Yamada et al. 2018) and triggering a photoprotective mechanism of direct recombination between QA− and P680+ in high light (Krupnik et al. 2013). On the acceptor side, the potential of QA−/QA is significantly less negative in C. merolae (Em = − 104 mV) than in spinach (Em = − 163 mV) (Shibamoto et al. 2010). Given that the midpoint potentials of the other redox cofactors, including QB−/QB, QBH2/QB− and Pheo−/Pheo are similar in these organisms (no comparable data available in the literature), the less negative Em of QA−/QA is expected to increase the QA− population and thereby the miss parameter in comparison to spinach PSII centers. In addition, the larger energy gap between Pheo−/Pheo and QA−/QA is expected to increase the lifetime of the S2 and S3 states in C. merolae PSII centers (Fig. 2). Interestingly, Allakhverdiev and coworkers reported a shift of redox potentials of QA and Pheo depending on the presence or absence of extrinsic proteins in the cyanobacterial PSII complexes of Synechocystis sp. and Acaryochloris marina (Allakhverdiev et al. 2010, 2011). Yet, the energetics of the water-splitting reaction in PSII RC was conserved, even though the potentials of QA− and Pheo− were relatively shifted depending on the identity of the primary donor special pair (being Chl a in Synechocystis and Chl d in Acaryochloris), pointing towards high conservation of the electron transfer processes in oxygenic photosynthesis. To analyze the effects of the altered QA−/QA midpoint potential in detail and to separate it from Si-state-dependent effects, we measured flash-induced oxygen yield patterns of C. merolae thylakoids at three different pH values and after H/D exchange, and analyzed the data using our global fit analysis approach. High pH is expected to simplify deprotonation reactions needed to advance the Mn4CaO5 cluster into the next Si state and to thereby reduce the donor side misses. It may also be expected that high pH makes it more difficult to protonate QB2−/QB−. This, in turn, may increase their midpoint potentials, likely leading to increased acceptor side misses. The results obtained in the present study are compared to literature data for spinach thylakoids measured under similar conditions. Cyanidioschyzon merolae cells were cultured at 42 °C and the thylakoids were isolated as described by (Krupnik et al. 2013), frozen in liquid nitrogen and stored at − 80 °C until used. On the day of the FIOP experiments, the thylakoids were thawed in the dark on ice and washed three times with buffer containing 10 mM CaCl2, 5 mM MgCl2, 1 M betaine, and either 40 mM succinic acid/NaOH (pH 5.0), 40 mM MES/NaOH (pH 6.1), or 40 mM HEPES/NaOH (pH 8.0). In the case of D2O experiments, the buffer was prepared in 99.9% D2O at 40 mM MES/NaOD (pD 6.1). In the last step, the samples were diluted to [Chl] = 0.5 mg/ml. After this treatment, which required ~ 10 min, the relative flash-induced O2 yields were 25% (pH 5.0), 100% (pH 6.1), and 45% (pH 8.0). No further decline in the activity was observed during the experiments. The C. merolae thylakoid sample had a small population of YDRED (≈ 10%). Therefore, the dark-adapted thylakoid sample was used without preflash treatment. The FIOP measurements on C. merolae thylakoids were performed with an unmodulated home-built Joliot-type electrode at 20 °C without adding artificial electron acceptors (Joliot 1972; Messinger and Renger 1993). Stock solutions of catalase from bovine liver (3809 U/mg, Sigma-Aldrich) were prepared by dissolving the frozen catalase powder in the respective measuring buffer. The catalase concentrations were determined using the Bradford assay (Bradford 1976; Sedmak and Grossberg 1977) and the enzymatic activities were measured using Beers assay (Beers and Sizer 1952; Aebi 1984). Then, 10,000 U/ml catalase was added into the thylakoid samples and the mixture was incubated for 10 min. In addition, the measuring buffer in the reservoir of the Joliot-electrode was continuously bubbled with N2 to remove O2 and prevent electrochemical formation of H2O2 during measurements (Pham and Messinger 2014). For each FIOP, a fresh 10-µl aliquot of the thylakoid sample was transferred to the surface of a bare Pt-cathode in dim green light and the sample was incubated for 3 min on the electrode to allow for settling and temperature adaptation. The polarization voltage of − 750 mV was switched on 40 s before illuminating the sample with a series of 16 flashes (2 Hz; Perkin Elmer, LS-1130-4 flash lamp). A personal computer was employed to trigger the flash lamp and to record the data at a sampling rate of 3600 points/s. The S2-, S3-, and S0-state lifetimes of thylakoid samples were measured in the same way by exciting dark-adapted samples with one (S2 state formation), two (S3 state formation), or three (S0 state formation) pre-flash(es) while resting on the electrode surface. After the desired dark time (td), a series of 16 flashes (2 Hz) was applied. The polarization was always applied 40 s before the flash series. For each FIOP, 16 oxygen yields were recorded. However, only the first 8 flash-induced oxygen yields were used for data analysis since thereafter, a strong decline of the O2 yield was observed (Fig. 3). In the global fitting approach, 384 flash-induced oxygen yields comprising all time points of the S2, S3, and S0 lifetime measurements were directly and simultaneously fitted by adjusting the rate constants of all Si state decays, the Si-state-dependent miss parameters, the double-hit probability, the activity/damping parameter, and the initial percentages of Si states, YD and QB− (Pham and Messinger 2016). 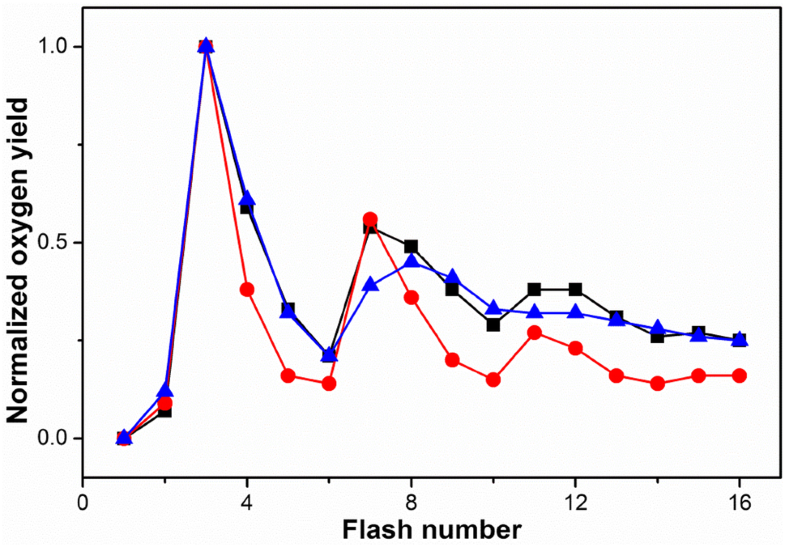 The flash-induced oxygen evolution patterns (FIOPs) and the Si-state lifetime measurements of C. merolae thylakoids were recorded at pH 5.0, 6.1, and 8.0 with a Joliot-type bare platinum electrode (Isgandarova et al. 2003). The results are presented in Figs. 3 and 4, as well as in Tables 1 and 2. Since the thylakoid preparation of C. merolae contained only about 10% of reduced YD, the FIOPs shown in Fig. 3 can be discussed qualitatively without considering the back reactions in the dark periods of 500 ms between the flashes. At pH 6.1, a clear period four oscillation with maxima after the 3rd, 7th, and 11th flash was seen, indicating a low average miss parameter (red spheres in Fig. 3). The overall amplitude of the 3rd oscillation (flashes 11 and onwards) was, however, untypically low. This FIOP was reminiscent to that of spinach BBY preparations, indicating a limited pool of plastoquinone bound on the acceptor side of C. merolae PSII complex embedded in thylakoid membrane fragments. After transferring the thylakoid samples to pH 5, a FIOP with a clearly increased miss parameter was obtained (black squares in Fig. 3). This was visible by the decreased ratio of the O2 yields induced by the 3rd flash (Y3) to that of the 4th flash (Y4). Similarly, the ratios Y7/Y8 and Y11/Y12 were diminished compared to those obtained at pH 6.1. Interestingly, the average O2 yield per flash obtained at higher flash numbers did not decrease to the same extent as at pH 6.1. This can be explained by the finding that the total O2 yield was only about 25% of that at neutral pH. The reduced number of active PSII complexes thus increased the number of plastoquinone molecules available for the active PSII complexes. The strong decline in the number of active PSII centers in thylakoids of C. merolae was surprising, since a recent report showed that the O2 rates of PSII core complexes isolated from the same organism are nearly invariant between pH 5.0 and 8.0 (Krupnik et al. 2013). Comparison of the FIOP obtained at pH 8.0 (blue triangles in Fig. 3) and pH 5.0 showed that while the first 6 normalized O2 yields were nearly identical, clear deviations were seen thereafter. Specifically, the Y7/Y8 ratio was inverted. This was indicative of a significantly different flash number or Si state dependence of the miss parameters at these two pH values. The total O2 yield was about 45% at pH 8.0 as compared to pH 6.1. This again resulted in a larger plastoquinone pool per active PSII complex. The global fit program (GFP) analysis confirms these qualitative observations. Table 1 compares the best-fit parameters obtained at each pH by either enforcing equal misses or by allowing the miss parameter to be different for each Si state transition. At pH 6.1, an equal miss fit results in a miss parameter α of about 11%, while in the best Si-state-dependent miss fit, all misses (35%) occur in the S2→S3 transition. Importantly, the fit quality of the unequal miss fit is twice as good as that of the equal miss fit, strongly favoring the fit where α2 parameter is largest. This is further supported by the finding that this fit result is systematically found once the equal miss constraint is released. However, when fits were started with a high value for α1 or α3 (all other αi = 0), stable solutions were obtained with 35% miss in the respective Si state transition. The fit qualities (FQ) of these fits were in between the best fit and the equal miss fit (Table 2). Nevertheless, as soon as a few percent α2 was included into the starting conditions, the GFP finds the solution where α2 = 35%. Forcing most misses into α0 resulted in unsatisfactory fits. The finding that only one S state transition is responsible for all misses, whereas the other transitions occur at 100% efficiency, is counterintuitive and may be explained by shallow fit minima. Increasing manually the percentages of misses in other transitions demonstrates that the fit quality deteriorates by less than 15% if either α1 or α3 is increased up to 5% at the expense of α2. In contrast, redistributing 10% miss from α2 to α1 or α3, individually or combined, or increasing α0 by only 3% leads to a 40% worsening of the fit quality. The fits for the pH 5.0 FIOP show the identical trends, except that the misses were higher: 18% for equal miss fits and 54% for the S2→S3 transition (Table 1). At this pH value, the unequal miss fit was nearly three times better compared to the equal miss fit. The fit where α3 is dominating has a nearly as good FQ as the one with α2 = 54%; however, the value of k21(fast) equals k21(slow), i.e., it was hitting the lower fit limit (Tables 1, 2). The fit where α1 is forced to be maximum, results in a fit that is nearly as poor as the equal miss fit. The large difference between the equal and Si-state-dependent miss approaches comes from the—relative to Y3/Y4—large Y7/Y8 ratio, which can only be modeled correctly with unequal misses, where α2 or α3 dominates. In contrast to pH 5.0 and 6.1, the FIOP obtained at pH 8.0 could not be fitted well when we assumed that all the misses occur in the S2→S3 transition or the S3→S0 transition (Tables 1, 2). For pH 8.0, an almost equally large percentage of misses occurred in the S0→S1 transition. Several good fits were also found where in addition to α0 and α2 also 5–20% α1 or α3 were included. 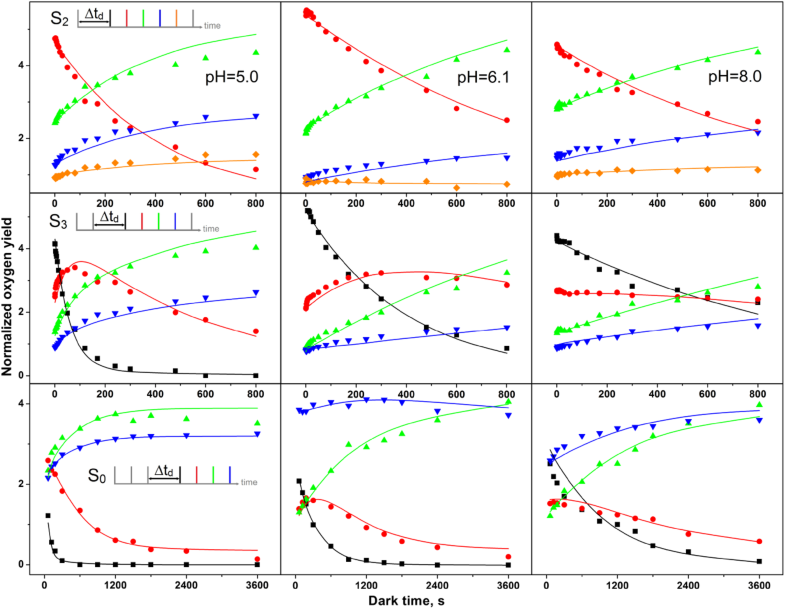 Therefore, the quantitative GFP analysis of the C. merolae FIOPs obtained at three different pH values strongly supports unequal misses, whereby the majority of the misses occur in the S2→S3 or, less likely, in the S3→S0 transition at acidic and neutral pH, while at alkaline pH the S0→S1 transition becomes also inefficient. If proton release was the limiting factor for the efficiency of a Si state transition, one would expect the miss probability to decrease with increasing pH. While this trend was observed for α2 when comparing pH 5.0 and 6.1, this trend was not detected at pH 8.0. Importantly, no binary oscillation of the miss parameter with the flash number (Si state) was found when analyzing the pH 5.0 and 6.1 data. This supports the above analysis, which relied on the assumption that the contributions of the donor side dominate the miss parameter, while effects of the acceptor on the miss parameter are negligible. In contrast, a pronounced binary oscillation of the miss parameter was observed at pH 8.0. This may be explained either by a high α0 and α2 or by high miss parameter connected to the presence of (QAQB)− on the acceptor side (Naber et al. 1993; Shinkarev and Wraight 1993). The pH jump experiments by Zaharieva et al. (2011) with spinach PSII membrane fragments, found effective pK values of 3.3, 3.5, and 4.6 for the inhibition of the S1→S2, S2→S3, and S3→S0 transitions at low pH, respectively. In contrast, none of the transitions showed decreased efficiencies at alkaline pH values. Furthermore, the S0→S1 transition was found to be pH independent between pH 3 and 9. On that basis, one would expect that the S3→S0 transition should be the only one affected by the pH under our experimental conditions. However, while the fits with large α3 generally gave acceptable results, they were consistently inferior to those with large α2. We thus suggest that the different time scales of incubation at the indicated pH, 1.5 s. vs > 10 min., are responsible for the deviating results. We also note that Zaharieva et al. (2011) observed relative changes in the efficiency of a specific Si state transition caused by pH changes, not in the absolute αi values, and that pH effects on the acceptor side are minimized in that study by giving only one flash at the desired pH value. Our preferred assignment for the acidic to neutral pH (α2 >> α3, α1, α0) agrees well with the results of Han et al. (2012) who reported a similar trend by following the Si state populations during a flash train via Si-state-specific EPR signals. A high α2 may be consistent with the proposed need of PSII samples in the S2 multiline (‘open cube’) configuration to first convert into the S2g = 4.1 state (‘closed cube’) configuration, before they can reach the S3 state (Retegan et al. 2016). Other possible explanations for why the highest miss parameter is connected to the S2→S3 transition may include the need to bind one additional substrate (possibly in the form of hydroxide) and the small driving force for this transition (Suzuki et al. 2008; Cox et al. 2014; Kim and Debus 2017). The increase of the miss probability of the S0→S1 and S2→S3 transitions in the alkaline pH cannot be easily explained by any of the above proposals, unless a second independent counter effect is brought into play. Since no artificial electron acceptors were used in this study, the period of two oscillations of the miss parameter may be taken as indication that the protonation of QB2− became a limiting factor between pH 7 and 8, or that the QA−/QA or QB−/QB midpoint potentials get more similar under these conditions, leading to a high QA− population on every second flash. Further studies will be necessary to untangle the C. merolae PSII donor and acceptor side contributions at alkaline pH. For Si-state lifetime experiments, the dark-adapted thylakoid sample (S1 state) was excited by 1, 2, or 3 flashes to enrich PSII in the S2, S3, or S0 state, respectively. Then, the dark time, td, to the subsequent FIOP flash train (2 Hz) was varied in suitable steps to probe the fast and slow decay components (see insets in Fig. 4). The symbols in Fig. 4 show how the experimental flash-induced O2 yields varied as a function of td during the three lifetime measurements. Plotted are either the O2-yields induced by flashes two to five (Y2–Y5; S2 state decay) or Y1–Y4 (S3 and S0 state decay). The S2 population can be qualitatively followed by the decay of Y2 (red dots), while Y1 tracks the S3 state population (black squares). The changes in the S1 and S0 populations can be estimated by amplitude changes of Y3 (green triangles) and Y4 (blue inverted triangles), respectively. In the top row of Fig. 4, the pH dependence of the reaction S2→S1 was studied. The simultaneous decay of Y2 and the corresponding rise of Y3 demonstrated for all three pH values a clean one-electron reduction process. Due to misses and double hits, a small rise of Y4 and Y5 was also observed. Only a very small fast phase was discernible, which was followed by one slower kinetic phase. 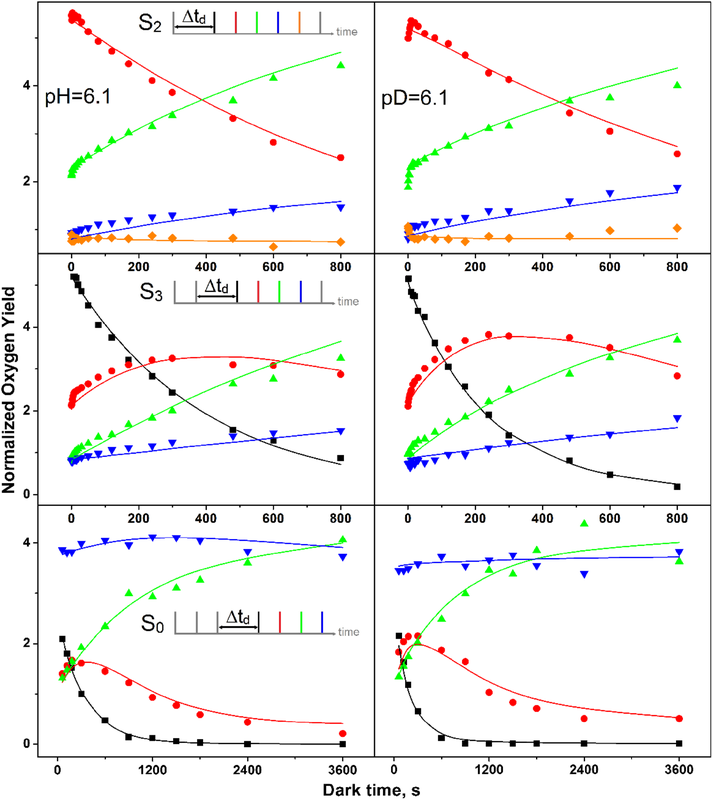 While there were not enough points for the fast phase to reliably analyze its pH dependence, it could be observed that the slow phase of S2 decay was about 2–3-fold faster at pH 5.0 than at the two other pH values. The pH dependence of the S3 decay is best followed by the data presented in the central row. Due to the rapid S3 decay at pH 5.0, the sequential decay of S3 (Y1)→S2 (Y2)→S1 (Y3) could be clearly discerned. Y4 increased nearly in parallel to Y3 due to misses. For the S3 decay, a strong retardation of the slow decay was observed at the higher pH values. For the S0→S1 reaction, a qualitative analysis was complicated, as the expected decrease of Y4 was compensated by the contribution of O2 to Y4, which comes from centers in the S1 state that due to α1 are delayed by one flash in O2 production. This time-dependent increase in the S1 state population is caused by S0 oxidation and by back reactions from the S3 and S2 states. In addition, the increasing YD population further increases Y4 by fast reduction of fractions of S2 and S3 between the flashes of the FIOP. Nevertheless, it appears that the S0 oxidation exhibits a complicated pH dependence in the C. merolae PSII complex, with the slowest rate near neutral pH. To our knowledge, no previous data for the S0→S1 reaction had been published at pH 5 or pH 8. The lines in Fig. 4 connect the amplitudes calculated by the GFP using the parameters given in Table 1 for the best fits. Overall, despite some small deviations, a satisfactory agreement with the data were achieved. The fits confirm the trends discussed above for the slow S2 and S3 state decays at the three pH values studied. While the S2 state decay is nearly pH independent (within a factor of 2), the rate of S3 decay slowed by more than a factor of 10 between pH 5 and 8. This is consistent with the previous data obtained from spinach thylakoids (Messinger and Renger 1994). The most surprising finding is the very strong pH dependence of the rates for the S0 → S1 transition. While the rate at pH 6.1 was well reproduced under all tested fit conditions and agreed within a factor of four with previous estimates in spinach thylakoids (Messinger and Renger 1994) and was practically identical with that determined with T. elongatus thylakoids (Messinger and Renger 1994; Isgandarova et al. 2003), the much faster oxidation rates at pH 5 and 8 were surprising. Since in the present experiments we were unable to obtain strong constraints for the fast decay kinetics, the values for k01 varied at the two extreme pH values quite considerably depending on the fit scenario. At pH 5.0, values between 0.21 and 2.7 s−1 were obtained, while k01 was found to be in the range of 0.00007 and 0.035 s−1 at pH 8.0. Thus, further studies are needed to determine the precise extent of the destabilization of S0 at pH 5.0 and 8.0. Possible reasons for the faster S0 oxidation could be related to the described two different positions of a water molecule near YD that appear to influence the redox potential of YD/YDOX (Umena et al. 2011; Saito et al. 2013; Sjöholm et al. 2017), and other pathways for S0 to S1 conversion may be possible under extreme pH conditions. At alkaline pH, also the easier removal of a proton may increase the rate of its conversion, since the S0→S1 transition is coupled to a proton release (Rappaport and Lavergne 1991; Siegbahn 2013; Klauss et al. 2015). To further understand the above pH effects, we performed a complete GFP analysis after H/D exchange at pD 6.1 (Table 3; Fig. 5). The data in Table 3 reveal that nearly all the fit parameters are identical under H2O and D2O. However, there is a twofold increase in the rate of S3QB− decay [k32(slow)] and a sixfold increase of the rate in S0 oxidation to S1. In addition, a very small increase of α2 from 35 to 37% was observed. The slightly higher value of α2 in D2O is in line with the idea that a proton release during the S2→S3 transition is required, since a slowdown of that rate due to the greater O–D bond strength will increase the miss parameter by increasing recombination reactions between QA− and YZOX (Zaharieva et al. 2011). However, the small magnitude of this effect indicates that this can only be one of the several factors contributing to the low efficiency of this transition. While the formation of the S1 state should be faster at high pH, the reduction of YDOX may occur faster at low pH. Indeed, a strong H/D effect was observed for the reactions S2YD→S1YDOX and S3YD→S2YDOX and was linked to the position of a water molecule near YD (Isgandarova 2004; Sjöholm et al. 2017). Zaharieva et al. (2011) observed a rapid inactivation of centers in the S0 state at low pH that occurs with a pKa of 4.6. We thus checked our data if a specific slower phase of S0 state inhibition could affect the Si state quantitation; no indications for that was found (data not shown). Overall, the miss parameters and Si-state lifetimes found here for the PSII complex of the extremophilic red alga C. merolae were similar to those obtained earlier for spinach (Messinger and Renger 1994). This indicates that C. merolae PSII is not specifically adapted to acidic pH values, in agreement with earlier reports that the internal pH of C. merolae cells is regulated to values similar to those of higher plant chloroplasts. Consequently, the significantly different QA−/QA midpoint potentials are not an adaptation to pH, but more likely to growth temperature. 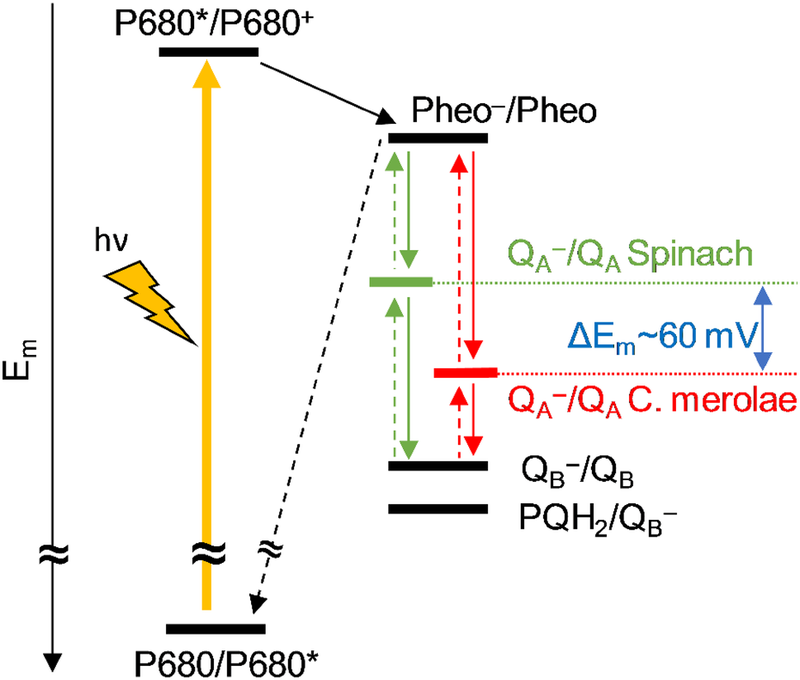 This is supported by the nearly identical rates for the slow S2 and S3 state decays in C. merolae and spinach if measured at 20 and 10 °C, respectively (Table 4), which demonstrates the expected stabilization of the S states by the increased energy gap between Pheo−/Pheo and QA−/QA. In contrast, the average miss parameter is nearly identical between these two organisms at pH 5.0 and 6.1 if measured at the same temperature (20 °C; Table 5), supporting the idea that it is determined by the unaltered donor side reactions. Global fits of the S3-, S2-, and S1-state lifetime measurements provide a powerful tool for studying the efficiency of PSII complexes under various conditions, in different species or mutants. By comparing the data obtained here with C. merolae thylakoids to our previous spinach data, we have demonstrated that the redox potential of QA−/QA plays only a minor role for the miss parameter, but instead mostly affects the Si-state lifetimes. This is likely due to the increased energy gap between the QA−/QA and Pheo−/Pheo redox pairs, which increases the barrier for the acceptor side electrons for recombination with the holes on the donor side, which occurs via the pheophytin cofactor (see Fig. 2). In addition, our data support the notion that the S2 → S3 transition is, at neutral pH, the least efficient step during the oxidation of water to molecular oxygen in the water-splitting enzyme, possibly due to the significant conformational changes occurring during the S2 → S3 transition, which include the binding of one water molecule (Suzuki et al. 2008; Siegbahn 2009; Capone et al. 2016; Retegan et al. 2016; Ugur et al. 2016; Kim and Debus 2017; Suga et al. 2017). LVP and JM were supported by the Swedish Research Council (VR, 2016–05183_3), the Swedish Energy Agency (2013–006259, project 38239-1), the Swedish Research Council FORMAS (213-2014-1504), and NordForsk (NordAqua NCoE, 82845). JK and JDJO gratefully acknowledge the financial support from the Polish National Science Centre (Grant No. UMO-2014/15/B/NZ1/00975 to JK).